One of the great joys of fatherhood for me has been introducing my son to the music of my youth. It’s no secret I’m a music freak, and my musical heart is strongly rooted in the 1980s. As a father you can only hope your kids at least appreciate the things you loved in your youth, but it’s something entirely unexpected and incredibly rewarding when your kid shows true exuberance for one of your loves. Tonight, as part of my birthday weekend, my son Connor and I will be seeing Tears For Fears in concert. The duo is without question one of my all-time favorite bands, and I have been fortunate to have seen them in concert three times over the past 30 years. But what makes tonight’s show so special is that my son is so excited about seeing Curt and Roland tonight that he is almost giddy. Yesterday I sent him a copy of the set list from the band’s show in Tulsa the other night and he was ecstatic about what we will be hearing tonight in Chandler. Even though Tears For Fears is one of my favorite bands, I’m more excited for him. And isn’t that really what parenthood is all about? 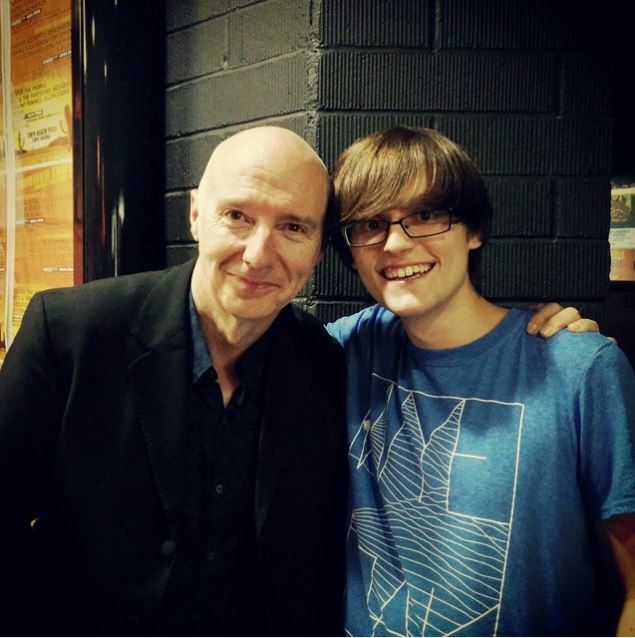 Connor got to meet the legendary Midge Ure last summer, one of his musical heroes. Connor loves 80s modern rock. When he was very young, he would sit in his car seat in the back of my car and sing along to whatever I was listening to, and that was most often 80s music. Depeche Mode. REM. U2. Talking Heads. Peter Gabriel. Joe Jackson. The Clash. As he got older, his tastes grew to appreciate the vast majority of my favorite artists. But that appreciation grew into a love and that was totally unexpected. At one time or another during the past few years I’d walk to the back of the house to hear the kid blasting XTC or Howard Jones or Talking Heads. At one time or another during the past few years if you asked him his favorite band, not his favorite 80s band, but his favorite band period, he probably would have said Ultravox. Which is why when we had the chance to see Midge Ure perform last summer here in Phoenix he considered witnessing Midge perform Vienna one of the highlights of his young life. After the show, which also featured Howard Jones, China Crisis and Thompson Twins, he got to meet Midge and the photo embedded in this blog post is one of his favorite images ever. Last year I showed him what for me is the greatest concert video ever filmed, Jonathan Demme’s sublime Stop Making Sense. He loved it, and now Talking Heads is at or near the top of his favorite bands list. But above all, Tears For Fears reigns supreme. Connor agrees with me that The Hurting is arguably the best modern rock album of the 80s. I can’t tell you how many times I’ve heard Mad World or Pale Shelter blasting from his speakers. He loves every song they have ever released, as do I. He loves the unheralded but wonderful Everybody Loves a Happy Ending, which was released in 2004 and is the band’s last studio album (although they are recording a new one right now!). It’s an album that very few people outside of true fans have probably heard, yet still classic TFF. One of the problems with loving 80s music is unless you were of age in the 80s your chances of ever seeing one of these great bands live is slim. Yes, there are a few retro shows now and then, but unfortunately Connor is not likely to ever see live performances by Talking Heads or XTC or The Smiths. Which is one reason why tonight’s Tears For Fears gig at Wild Horse Pass is so special to him and why the best part of my birthday weekend will be experiencing the show through his eyes. Yes, my son and I also enjoy many modern bands together. Arcade Fire. Phoenix. Black Keys to name a few. But there will always be something special, something that connects us, when it comes to the music of the 80s. I hope you have something similar to this with your offspring. It was great to meet Connor at the Heart Museum breakfast! I’m glad that you’ve given him a strong appreciation for good music. That’s so cool, Len. Glad he gets to see them. My son really likes Ultravox, too—and 80’s music (even the bad stuff). But, my love of indie rock/emo/EDM/punk has rubbed off on him even more. I love that he appreciated New Pornographers when we saw them, and we’ll be seeing Fall Out Boy for the third time together in two months. I wish he appreciated the old farts more, but he’s a thoroughly modern kid. Incidentally, “The Hurting” was a staple of my and Kelly’s courtship, and we saw TFF live in 1984 (followed by Frankie Goes to Hollywood in the same venue a week later!). I hope Connor has a great time at the show, and that you do as well! Hello Lenny, This is coming from your friend, Gregg’s mother. I worked with teen mom as a social worker, and somewhere around 2005 I had a teen mom, about 16 years old, who wanted to name her child Hendrix, and the next one Joplin. Now that is dedication to old and great music! She loved the older music. 80s music was a truly great time!